It began shortly after Karoline was born, I think. Actually, I got hit over the head with it. Megan was over and we were trying to weed the maternity items out of my closet. As I bent to remove some tops from the bottom shelf/hanging rack, the top shelf/hanging rack groaned under the weight of its burden and heaved itself away from the wall. I literally got hit over the head with our abundance! We have too much stuff. Then, the day after Thanksgiving at an extended family party to celebrate birthdays,everyone was talking about how all our babies look so much alike around three months. 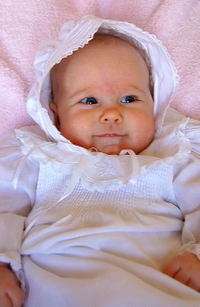 At three months, when I know that they will smile on cue, I put them all back in the christening gown and have a portrait made. All the portraits hang together on a hallway wall. On this particular day, my husband took them all off the wall and mixed them up and challenged our guests to put them in order. My second son is the only one of the children who was baptized in a different gown. He was too large for the family heirloom. But my sister-in-law noticed that another baby was wearing a gown she'd never before seen. "Why is this baby wearing that gown?" "Because," I replied, feeling my cheeks grow warm, "I had scheduled the photo and was ready to go and I couldn't find the christening gown. I borrowed one from Missy." That was my seventh baby. Couldn't keep track of the christening gown. Too much stuff. So when I read about A Year of Abundance a few days after the family photo game,I tucked away the icon for later consideration. I wondered, though, if was I playing to my tendency to be a bit puritanical. After Thanksgiving, I lost a stash of cash that I'd been squirreling away for eight months. I don't know how or where. I just can't find it. And I can't find my cell phone. And I can't find an i-tunes gift card. And I can't find the Delta level Math-U-See book. We were organized. Before the baby came. But the truth of the matter is, it's not the baby; you can't stay organized when you have too much stuff. Every time I wonder aloud about our stuff, I say something like, "We have too much stuff. Why do we have all this stuff?" To which my four-year-old sagely replies, "We have eight kids!" It's true, more people, more stuff. If every child gets two things for Christmas (which is what we did), that's still sixteen more items in the house. And that doesn't count the influx from grandparents, godparents, and aunts. I found myself, one day shortly before Christmas, in a store with Nicholas. He was begging for something, insisting that he needed it. "No," I replied, "you don't need it. We don't need anything. We have everything we want." Everything we want. Not everything we need, but everything we want. We live a life of abundance. My puritanical worries were put to rest when I read about A Year of Abundance on Willa's blog. Historically, Willa has been good about letting me know if I'm being puritanical;-). And then I read Lindsey's interpretation. Upon further reflection, however, I think I've got a vision for my own year of abundance. If God were to raise his hands over my "stuff" in a gesture like the epiclesis and with that gesture give me the grace to see how He intends me to use it and to do whatever He wants me to with it, the result would be a life of abundance.A life that the Lord intends for us. But it wouldn't be chaotic abundance. I wouldn't be tripping over Legos in the middle of the night. I wouldn't be pestering St. Anthony over stuff every day. It would be peaceful, beautiful abundance. My goal is to take "my stuff" to prayer--to consider all of it prayerfully and to care for it prayerfully, too. In doing so, I hope to help my family see how abundantly the Lord has provided, how we need nothing and how we bless each other and give God glory when we care well for what we have.